Jason Reitman's 'Ghostbusters' Sequel Already has a Teaser Trailer, and it's Perfect! It's been like, 12 hours since we were hit with the news that Jason "son of Ivan" Reitman has been working for months on a secret Ghostbusters follow-up which will center on 4 teenagers and pass the torch from the OG crew. Travis just posted on this last night, check his article out here then come back and watch the teaser. There's so much I love about this teaser, first and foremost...it's a teaser in it's true form, showing almost nothing. 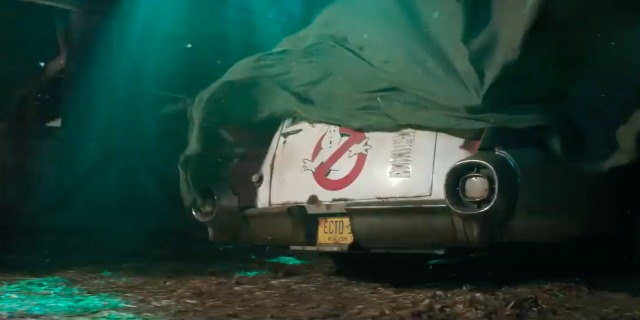 A slow creep on an old farmhouse where a vehicle sits under a cover, the theme song slowly playing in the background until a wind blows through revealing ECTO-1 under the cover. It's perfect, it tells you everything you'd want to know and still retains a high level of mystery. Obviously the team hasn't been 'bustin for some time, a new group is going to come upon their old turf. Everything else should remain unknown. I just hope other filmmakers take a note from Reitman here and realize that sometimes less is more.